Buying my artwork is as easy as clicking on one of the images in the gallery, and then hitting the green “Add to Cart” button below the image. That will take you to my Paypal page where you can see your invoice, and also how much it will cost to ship your painting. I will send by Canada Post regular mail to anywhere in Canada, the US, or overseas. Shipping will be added to the amount when you click on the “Add to Cart” button, along with a small charge to cover packing materials. Please carefully review the prices before you confirm the order. You will then get an invoice via email. I will send out your painting, carefully packed, as quickly as possible. Paintings are usually done on 90-lb. Fabriano watercolour paper, or high-rag-content paper I inherited from my mom (I’ll let you know which on the page for each work). Each painting is matted in a hand-cut acid-free cardboard mat with a backing board of the same high-quality material. I join the mat and the backing board with archival-quality linen hinging tape. 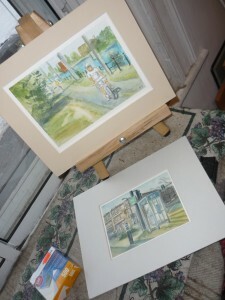 The painting is attached to the backing board with archival-quality (again!) mounting corners (never glued to the backing). This is so that the painting can be slipped out without damage, if you would like to place it inside a different mat. My works of art are mailed pre-matted, in one of two ways: in a Number 4 padded envelope, inside a sandwich of oversized cardboard to protect the surface of the painting, or in a regular oversized envelope, with the painting and protective cardboard wrapped inside a sheet of flexible packing foam. The package inside is sealed in clear plastic for protection against moisture. The mat and the backing usually measure eight inches by ten inches, unless a different size is specified on the item’s page. You can then easily slip the matted picture into a standard 8″ x 10″ frame of any kind. As is usual for artists selling original works, I will retain reproduction rights to the images, in case I want to sell prints.